My LED turn signals arrived, so I just installed them on my 2002 Yamaha Virago 250. 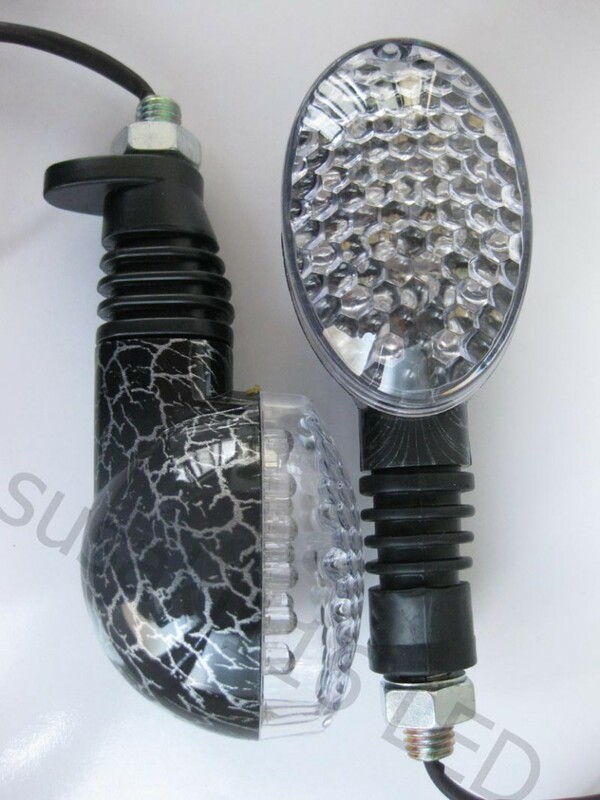 I looked through every single LED turn signal on ebay – I liked six of them – and ended up buying the cheapest one. signals would serve to support my carry bag – I really did not want to buy a luggage rack. And mounting them 1.75 inches higher makes the bike a little safer – so that is good. 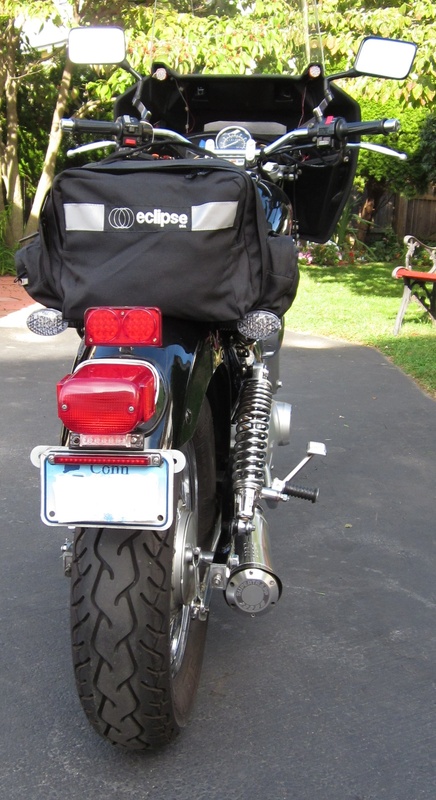 The Eclipse bag is an example of keeping things light for more performance – it weighs 2.4 lbs or 1.1 kg and holds 1,500 cubic inches of gear. The saddlebags that came with the bike weighed 7.2 lbs or 3.3 kg and held 1,034 cubic inches. 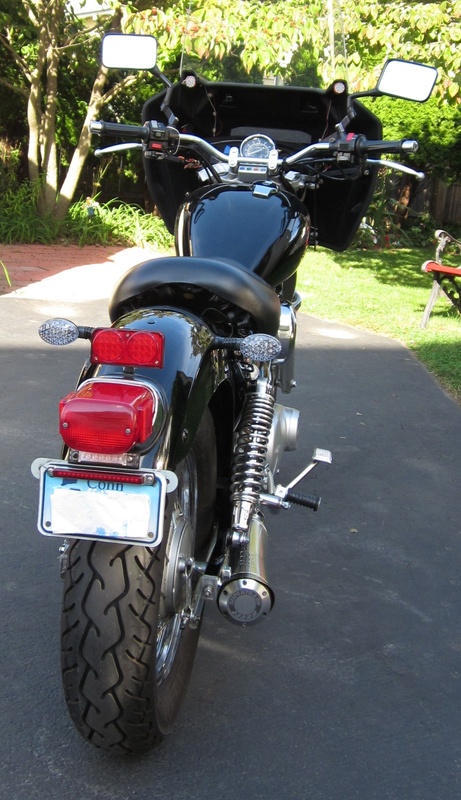 -Les S.
This entry was posted in Motorcycles and tagged aftermarket Virago, aftermarket Virago 250 parts, LED turn signals, Motorcycle safety, Motorcycle turn signals, Virago 250 mods, Virago 250 turn signals, Virago safety, XV250 turn signals. Bookmark the permalink. What exactly do you do next to wire it? Awesome bike by the way! You should use both the stock tail light and the LED tail light. Using two tail/brake lights (or more) makes riding safer, including daytime riding. I have four tail/brake lights which helps me stay safe on my long commute, a lot of it in 3 lanes of traffic on I-95 in Connecticut. Hope this helps – thanks for asking. How do you get the light to stand up like that? im ordering one off ebay and i have a xv250, do i need to buy a bracket or something to keep it in an upright position? Are you asking about the light in the center that I added ? You can mount it right above the stock tail-light – remove the reflector and mount it using the reflector’s metal bracket. yeah! ohh I get it now thanks Les! You mentioned buying a Virago 250 for $1200. In what kind of shape was that bike? Oil grittiness, forks leaking, seat torn, brakes worn, tires? How about the paint or dings? When I got it, it didn’t really need much. The forks, seat, brakes, and tires were good. The paint was very good and it had no major dings. You can see pictures of it in the posts on this site that are from 2011. Where did you get your handlebars I’m looking to buy some exactly like yours for mine? Hi Justin, My bike came with the low bars, so I do not know where they were purchased. The bars are about 29 inches wide, 4 ½ inches pullback, and 2 inches rise.